Fig. 335 shows a circular frame made up in two thicknesses, the segments being screwed to each other and the joints crossed in two layers. 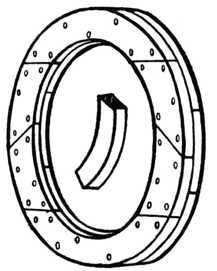 This is a very strong method, and it is used for making circular frames and curbs up to 15 ft. in diameter. The segments can be either long or short, the only important condition being that they must be marked out and sawn to the correct radius. Fig. 337 shows a board marked out in segments for this class of work. The longer the boards the better will they cut up, as it gives more opportunities of cutting one piece out of the other as at A A. Fig. 335.—Circular Frame in Two Thicknesses. Fig. 336.—Circular Rim in Halved Segments. Fig. 338 shows how to begin to put the work together. To continue this, fit other segments in position and screw them to D and E respectively. The completed work is illustrated at Fig. 335. Fig. 337.—Board Marked for Circular Jointing. Fig. 338.—Putting Circular Work Together. 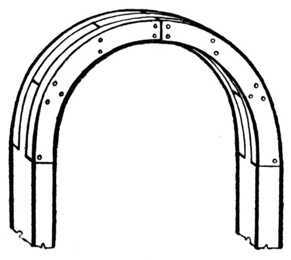 Method of Building up Semicircular Head of Door Frame. Fig. 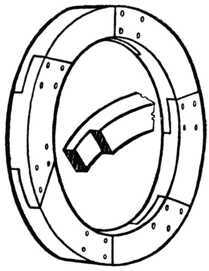 336 shows a circular rim, or curb, made of segments which are halved together. 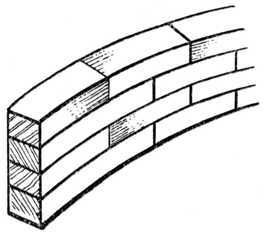 This method is suitable for heavy work, where the timbers are of considerable size. The halvings are cut on the ends of the segments to any convenient shape or bevel, each one being marked so as to fit its fellow. Fig. 341.—Part of Laminated Table Frame. Fig. 342.—Half of Laminated Core Box. When extra length is required, semicircular or circular work is built up out of four or five thicknesses of wood, and the method is called laminating. 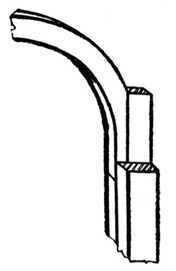 The method of building up the semicircular head of a door frame by this method is shown at Figs. 339 and 340. The shaped framing for kidney-shaped writing tables and similar classes of work is built up by laminating pieces of 3⁄4-in. or 1-in. wood, after which the face side is veneered so as to hide the glued joints. Fig. 341 shows a sketch of one quarter of an elliptical table frame levelled up and ready for applying the veneer. 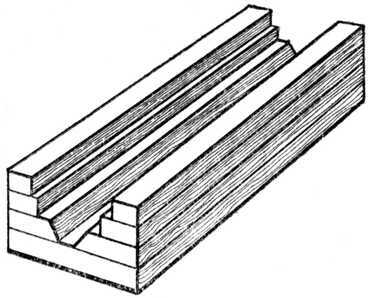 Lamination.—If we apply to the dictionary for the word “lamination,” we find that lamellar structure is the arrangements in thin plates or layers one over the other, usually having the end joints alternating, and it is a condition which allows of cleavage in one direction only. This method is used for nearly all descriptions of free or irregular curves, such as sweeps, bends, ogee shapes, and segments of circles. The timber is marked out in suitable lengths, rough-sawn and then planed true on the face, glued together, and when set the sides are cleaned up to the required shape. It is one of the strongest methods of construction, and necessarily costly. Pulleys, pulley rims, and a hundred and one other jobs are built by this method. Fig. 342 shows one half of a core box built by this method, ready to be worked to the required shape.